Your choice of investment style and lifestyle are intimately connected. For me, the logic of investing for income comes from a pretty simple mental model of the mechanism that money plays in my life. This logic is not new - as Charles Dickens put it into the mouth of Mr Micawber over 150 years ago: essentially your financial success depends on your lifestyle, in particular the balance between income and expenditure. 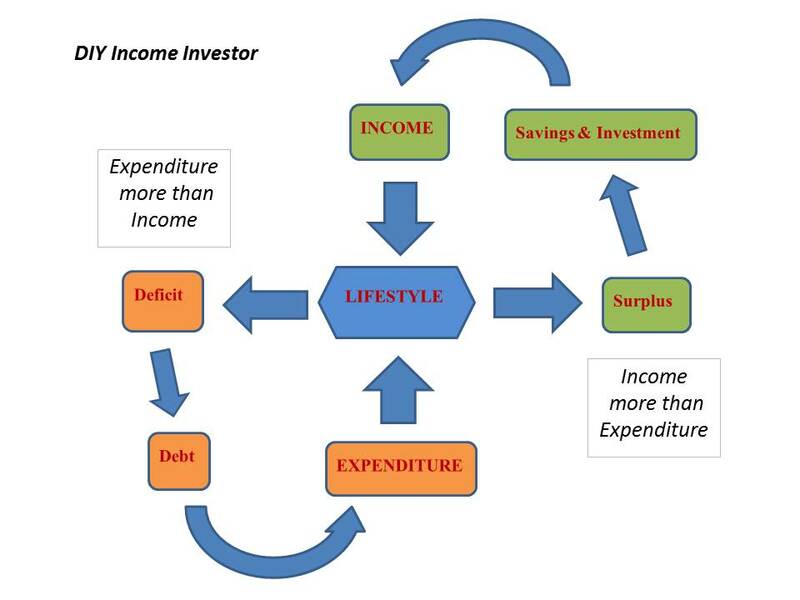 The logic is pretty simple at heart, as shown in the graphic: your financial well-being depends on your lifestyle, in particular the balance between income and expenditure. Now, this is just the starting point, of course: once you are on the happy path of having adopted a lifestyle that generates a financial surplus, the magic begins. The magic of compounding or the Money Snowball, as I like to think about it. 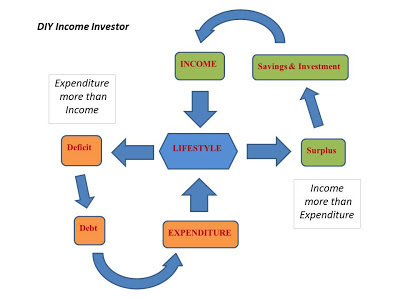 And it is just a small step from there to focus on an income-oriented investing style, as this is consistent with a view of the key role that surplus income plays in growing your wealth. This focus on income makes it easier to think about what to invest your money in: your criteria are yield and risk - factors that you assess by yourself pretty much, without paying someone else to do it. Of course, there are other investment styles that can prove successful but for me they lack the simplicity and coherence of a focus on income. Keeping my expenditure under control and having regular surplus income from a range of sources and asset classes is a great reassurance in difficult times. I agree that the balance between lifestyle and investment style should be carefully linked and I admit that I have lived roughly in accordance with your recommendations for the last decade. However, given my age and circumstances I am increasingly attracted to a contrary view for managing my life and income. Having reached my early 60s with a comfortable investment pot, I'm seriously considering a decade of "life experience surplus", which unfortunately will also entail a decade of income deficiency. My investments are capable of generating annual income (based on 4% yield) equal to my gross salary of old. ie enough for a comfortable lifestyle and some. However, the world has many places I haven't seen and many exciting and luxury experiences I haven't lived. At best my wife and I have the opportunity for a golden decade to really enjoy the fruits of our labour, before age slows us down. So I have been thinking, what would be the consequences if we were to consume 50% more (ie enough to go anywhere we want and do most things within reason) for the next ten years. I've come to the conclusion that the effect is surprisingly benign. We will lose 2% of our assets per year for a decade, which equates to approx 16% over the period. Not good, but during this period we will both start drawing our full state pensions (plus SERPS in my case) and my wife also has a small occupational pension to come. So some of the income loss will not be permanent (say 6%). At the end of the decade, I will be in my early 70s and my wife in her late 60s. An age at which living on a 10% reduced income will probably be no hardship at all. Contrast this with just rolling along for the next ten years and then having virtually unconsumable wealth from my early 70s and the decision is no contest. I want to have lived!!! So what about inflation? Well, all our pensions are index linked and hopefully the capital appreciation of the shares and property portions of our investments will manage to keep up. Great idea and analysis - this is what DIY investing should lead to: a thoughtful and confident use of the resources you have amassed during your working life. I've written before about the bargains on offer if you like cruising - a great way to see the world and cruises can be found at less (sometimes much less) than £100 a day all-in! I'd be inclined to take it a bit slower but plan for longer. I say this only because my uncle and my mother are both 75 and show no signs of stopping their travels. My mum has just got back from Portugal and plans to see her sister in Australia next year. My uncle is busy with a woman in the Philippines and is going back and fro all the time!! Honestly, at 75, they seem to have more energy than I did when I was interrailing as a student! Valid point as my parents are 96 and 86 and didn't stop traveling until my father reached his mid 80s. 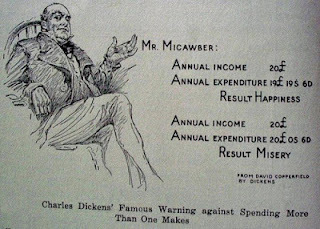 However, in 10 years time I won't still be paying for 2 children through university.